There is nothing like home-made ribs. And, once you get over the intimidation factor, you realize that they don’t take nearly as long to cook as barbecue myth has it, and they are also very easy to prepare. 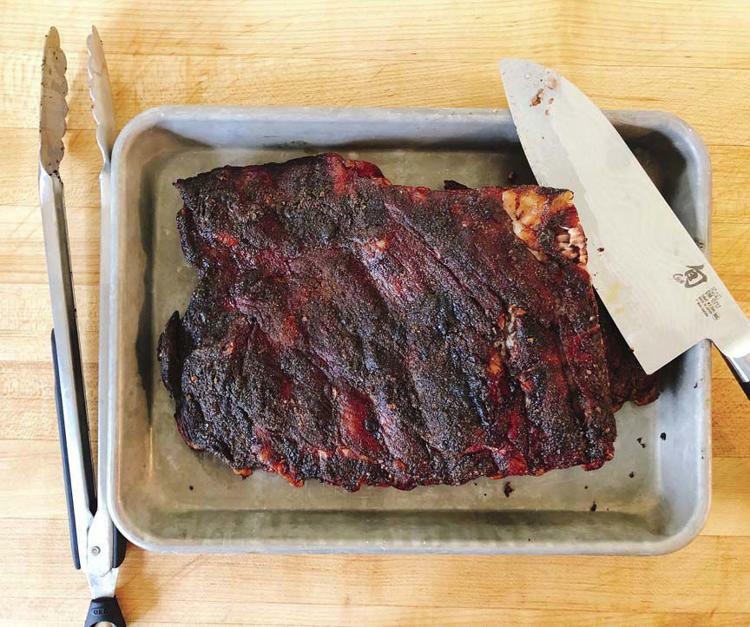 I might be a little rib obsessed — it is an occupational hazard of barbecuing for a living. But I don’t know many people who can turn down a bone or two or three. My rib-awakening happened at the world’s largest barbecue contest — Memphis in May. 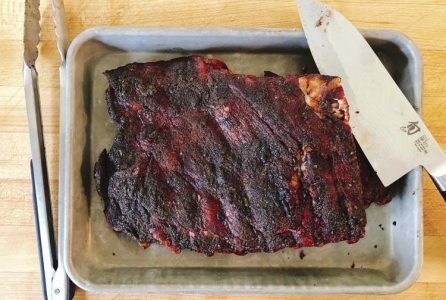 All it took was that first bite of a grill-smoked rib for me to realize that real barbecued ribs very rarely come out of a restaurant kitchen. They are usually much better made and enjoyed in your own backyard. The most popular ribs to cook are back ribs, but spareribs and St-Louis style ribs are becoming more and more popular. This week, I cooked a slab of back ribs, a slab of spare ribs, and a slab of St. Louis to see which ones I liked better. Not surprisingly, they were all good. I re-discovered that it’s important to look at the ribs in the store and chose them based on the way they look more than the cut. They should be plump, heavy for their size and have some visible fat. The fat will render out during the cooking time, leaving flavor and help create a nice crust on the ribs. These days pork can be so lean that you don’t see a lot of fat, even on the ribs. 🔶Back ribs are cut from high up on the rib near the spinal column. Back ribs are meaty, leaner than spareribs and very flavorful_this is the area of the pig that “produces” the tenderloin. Back ribs are usually sold in either full slabs (13-ribs). But you may find them in half slabs (7-ribs) since they are the most expensive cut of rib, some stores cut the rack in half so the single item appears less expensive. When they come from a pig that is less than a year old, they are referred to as “baby” back ribs. True baby back ribs generally weigh around 1 to 1 1/2 pounds each which makes them difficult to cook on the grill because they have so little meat on their bones. 🔶Spareribs are cut from the belly or side of the pig. Spareribs are longer and fattier than back ribs. While they have less meat, many parts of the country prefer them and they are also a bargain. I paid about $2.50 a pound for a full slab of spareribs and the back ribs were nearly $10 a pound. 🔶The St-Louis cut is a sparerib trimmed to remove the flap of meat on the underside of the breast bone and squared off to more easily fit on the grill. The St. Louis-style cut is becoming more popular with restaurants, backyard barbecuers and the barbecue circuit. Once you decide on which rib to buy, there are a few things to remember when purchasing your meat. Number one: Make sure that each slab weighs close to 2 pounds each, and that the ribs have a nice layer of meat covering the bone. Slabs of ribs that are factory-cut often have “bone shine” or areas of the rack where the blade hit the bone and cut off all the meat exposing the bone. And, it goes without saying that you need to buy the best quality, freshest product available. This is especially true with meat and there is a wide range of product in the marketplace. Plan on purchasing half a rack per person, more if you are serving big eaters. I always round up one rack, for example, if I am serving 7-8 people, I buy 5 racks of ribs. After taking the time to make the ribs, you don’t want to run out. If you have a local butcher who cuts the meat, frequent his or her shop. He’ll give you tips on cooking, can cut meat to order, and can special order meat as well. If you don’t have a local butcher, go to a grocery store that has high traffic and keeps the meat case rotated with fresh product every day. Beyond that, be sure to look at the expiration date on the label and give your purchases the old-fashioned smell test. If it smells “off” or a little funny, then it is probably old. I prefer buying ribs that are cryovac-ed as they are generally the freshest choice. The next decision that you have to make is whether or not to remove the silver skin. Along the back (non-meaty) side of a slab of ribs there is a smooth covering or membrane that holds the ribs together. It is often referred to as the silver skin. Some people recommend removing it but it is purely optional whether you take it off or not. If you leave it on, it is a good indicator of when the ribs are done because it lifts away from the meat when the meat is cooked. It is very crispy when done and looks a little like parchment paper and is slightly translucent. Many people consider it a delicacy and really like eating it, and many more don’t even know it is removable. A few cooks say that leaving the membrane intact prevents the seasoning from penetrating the meat and stops the rendering of the fat. I have never found this to be true, I think that it is mostly a cosmetic issue and a little known one at that. Be forewarned, if your rack of ribs has any “bone shine,” the membrane will keep the rack intact and if you remove it, your rack will likely fall apart. The final thing that you need to know is that the best way to test for doneness is to make sure that the meat has receded from the end of the bones and that you can bend the rack without breaking it in pieces. And, remember that the only way that the meat will fall off the bone, is if you par-boil them first (just say no!) or if you over-cook them. The best ribs should be tender but have a little “chew” left. This recipe is my version of ribs that made me fall in love with backyard ribs. The Memphis in May barbecue team took me under their wing and shared their secret of slathering the ribs in fresh lemon juice before seasoning them. Build charcoal fire or preheat gas grill. Remove silver skin from back of ribs, if desired. I prefer to leave it on the ribs. Set up the grill for indirect heat and if using wood chips, place soaked chips directly on charcoal, or in smoking box of gas grill. Rub the cut lemons over front and back of ribs squeezing to release as much juice as possible. Discard any lemon seeds. Set aside for 5 minutes. Sprinkle ribs liberally with spice rub and let sit, covered, for 15 minutes. Place ribs (bone side down) in the center of the cooking grate or in a rib holder/rack, making sure they are not over a direct flame. Grill covered (at about 300 F, if your grill has a thermometer) for 2-3 hours, depending on how big your racks are. Two-pound racks will take about 2 hours and 3-pound racks will take closer to 3 hours. The meat will be tender, and you can see that it has pulled back (receded) from the ends of the rib bones. Leave ribs untended for the first 30 minutes—this means no peeking; especially important if using wood chips. If the ribs start to burn on the edges, stack them on top of one another in the very center of the grill and lower your fire/heat slightly. Twenty minutes before serving, un-stack ribs, if necessary, and brush with barbecue sauce. Remove ribs from grill and let rest 10 minutes before cutting into individual or 2-3 rib portions. Warm remaining sauce in a saucepan and serve on the side, if desired. Nutrition information per serving: 221 calories; 115 calories from fat; 13 g fat (4 g saturated; 0 g trans fats); 72 mg cholesterol; 627 mg sodium; 5 g carbohydrate; 0 g fiber; 3 g sugar; 22 g protein.